I used to read a lot of fiction as a child, but I usually read non-fiction. I got this book at a BookExpo a few years ago. This book is an easy read, and I really enjoyed it. 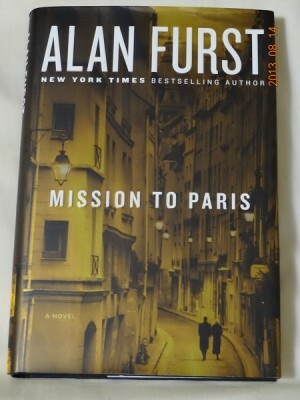 This novel is set in Paris in 1938. The protagonist, Frederic Stahl, is an actor living in California. He is really Franz Stalka, born in Vienna forty years ago. Surviving the First World War, Stahl eventually immigrated to the United States and eventually found himself as a movie star—not as big as Cary Grant or Marlene Dietrich, but people usually recognized him. A Lothario, Stahl likes women. A lot. Though Stahl never fought in the war, he is a rather brave and ethical man—whose character is sorely tested. Finding himself in Paris to make a movie for Warner Brothers, Stahl settles into the city that he had lived in twenty years before. Right away he finds himself in the middle of web of intrigue. Because he’s not a naturalized citizen (Stahl never got around to filling out the papers for U.S. citizenship), he is viewed by the Nazis as a citizen of their Third Reich, and as such he should join their cause. Therefore, they use their operatives in Paris to bring Stahl to Germany. I know something of the Second World War because of my graduate studies at the University of Pittsburgh. However, my work primarily centered on southeastern and Central Europe. Whenever the German occupation of France was brought up by colleagues, I heard the same remark: there was more collaboration in France than the French wanted to admit. Now I understand what they meant. French politics and society were polarized. A lot of Nazi money (probably confiscated from the German Jews) poured into France, given to French sympathizers of Hitler or simply the greedy who saw no problem in stopping anything that remotely threatened Franco-German relations, like rearmament. Strikes, protests and urban disturbances continued to erupt as supporters of rearmament fought those in appeasing—couched in the term of “eternal friendship”—with Germany. Stahl plays the cat-and-mouse game for a while with the German supporters and agents until he realizes that his life may be in danger. He ends up in the U.S. Embassy. The Americans are trying to gather as much information on the Nazis, and Stahl ends up working as a spy—which really does endanger his life. This book is a quick read, and I really enjoyed it.